The 25th Anniversary Special Edition of Pumping Iron - now on Blu-ray. The 25th Anniversary Special Edition of Pumping Iron is now on Blu-ray. This is the most famous bodybuilding DVD ever produced! It is the definitive DVD on the sport of bodybuilding and has been seen by more bodybuilding fans than any other DVD on our great sport. This film also introduced Arnold to a wider world audience, and also put him on the map to go on to a huge and very successful career in the movies. Click here for the Arnold Photo Gallery. In 1977 an independent documentary movie shone a light on the world of bodybuilding, becoming a huge box office hit and creating an international sensation. It launched one man's multi-million dollar career and changed the world of bodybuilding and physical exercise forever: "Pumping Iron". Starring five-time Mr. Olympia, Arnold Schwarzenegger, the movie followed the 28-year old bodybuilder as he competed for his 6th title. Pumping Iron the movie is a 1977 production highlighting the world of bodybuilding, and in particular focusing on the 1975 IFBB Olympia and Mr. Universe contests in South Africa. Most of the film focuses on the intense rivalry and competition between Arnold Schwarzenegger and Lou Ferrigno. The production also features some segments on other bodybuilders such as Franco Columbu, Ken Waller, Mike Katz, Ed Corney, Serge Nubret, Robby Robinson, Paul Grant and other top men of that time. The main part of the film was shot during the 100 days leading up to these two contests held in Pretoria, South Africa, with the final movie scenes shot during the contest. Bonus material exclusive to this 25th Anniversary edition features more than 84 minutes of new, never-before-released programming. 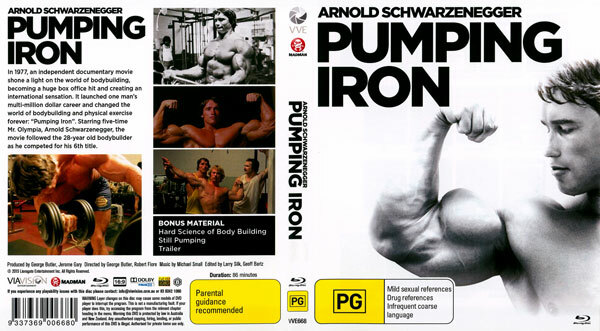 Check out the historic display of past PUMPING IRON video covers on the standard version page. Produced by George Butler, Jerome Gary Directed by George Butler, Robert Fiore Music by Michael Small Edited by Larry Silk, Geoff Bartz © 2015 Lionsgate Entertainment Inc. All Rights Reserved. WARNING: Layer changes on this disc may cause some models of DVD to Interrupt the program. This is not a manufacturing fault. lf your player does this, try accessing the program from the relevant chapter heading In the menu. Warning this DVD is protected tv law In Australia and New Zealand.